The image on the right is a 150 dpi scan of a portion near the centre of the image on the left. The wood is from a camphor laurel branch we had to cut in order to get the Nimbin rocks community house onto the property (it was move from queensland). The timber was left laying in the paddock for around 6 months - until I grabbed it last week. 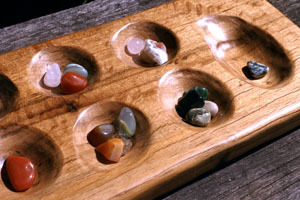 This is a mancala board I made out of camphor.. This is a piece of dead branch from a tree at Nimbin. Numerous defects in the wood make it a good candidate for oxidation in my stove, but this was just a narrow piece - the thicker part of the branch may be in better condition. This was a dead tree at my Ipswich residence. A fast grown short lived tree I planted some ten years ago. It grew to full size in maybe 6 years and died of old age six months ago. The trunk was straight and perhaps 180mm thick at the base. 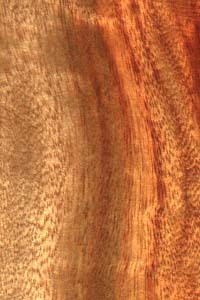 It's too small to be of any interest to a conventional saw mill but is an attractive wood a hobbyist could mill for things like window trimming or for wood turning (small bowls and such). The sapling was sold as a Cootamundra Wattle but I doubt that the label was correct. Wattle trees are fairly soft and prone to wood boring insects. This tree already had a 5mm termite hole up the centre but only for 400mm or so from ground level. Black bean is a local native tree, mature trees have large patches of dark wood in them but this young tree had very little. This tree was spilt in two by a falling river-oak (below) this branch was dead but still fresh. I oven dried this sample to speed things up. One negative of this tree is the beans are sometimes eaten by cattle and the cattle can die as a result. Later.. As the wood aged a black pattern formed all over it. Another native tree. This was from a large tree which fell across the creek when the bank is was growing in was eroded away - this is a common occurrence. I had hoped to salvage the timber when my mill was extended to handle the longer lengths but borers, ants and decay seem to be beating me. This sample was from the top of the tree which had fallen across the creek and onto the opposite bank. It had been laying some 9 months on the moist soil and was saturated when I cut it. It was full on black ants and showing signs of cracking and decay. Oven drying it expanded the cracks. 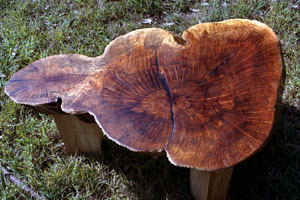 In early 1999 I salvaged a large log which is described in mill-2.htm. 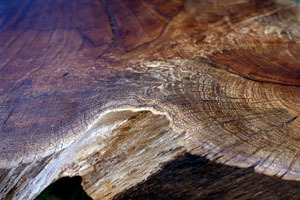 The wood changes dramatically as it ages and starts to decay. It cracks like crazy especially when cross cut and is generally labor intensive. This is what the my end product looks like. Note the large filled crack - one almost splitting the table in two. 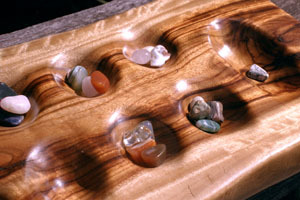 T his is a mancala board I made out of Casuarina. This is a noxious pest which rivals the camphor laurel in it's invasiveness of the creek gullies. When I cut my first one this week I was pleasantly surprised by the exposed timber. 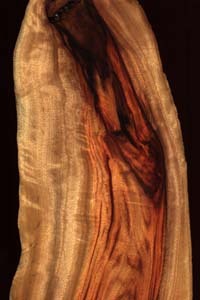 When freshly cut the the massive heart wood is a beetroot colour with and interesting pattern in it. As the wood dries it fades to a sort of bronzy color. 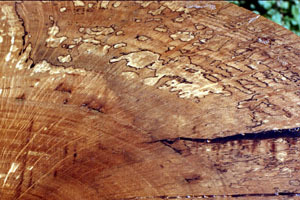 The bands which are visible in this image appear to be growth rings. They are roughly 10mm apart showing to fast growing nature of this tree. The thorns are around 80mm long and needle sharp. This make it a dangerous tree to handle. The trees are bare of leaves during winter making it hard to tell live trees from dead ones. Despite efforts to poison some trees - I haven't seen any dead ones yet. 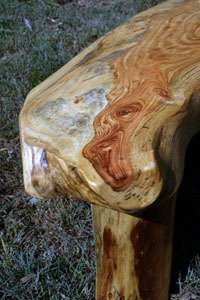 This slab was taken from a poisoned tree. The tree was felled and left for around 6 months. The poisoned bits were decaying and full of boring insects. While the bark is normally almost impossible to remove - after the insects have been chewing it for six months it tends to fall off. The holes and gray patches ended up looking quite good but next time (if there is one) I'll slab them green and dry them under cover.